Trail Effect: The Phantom Trail Race: The beginning of my own mountain madness. 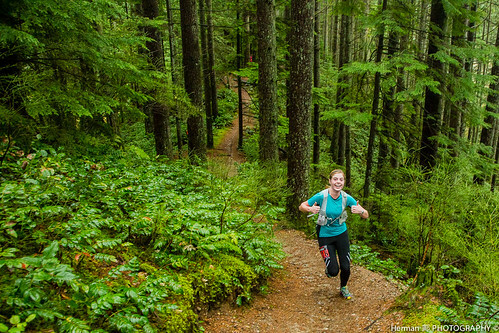 The Phantom Trail Race: The beginning of my own mountain madness. In 2011, I took on the Phantom 12k race as my first ever trail race. The idea of so many scary looking uphills in a race frightened me, but the fact that it wasn't frowned upon to walk some of them made me feel a bit better. By the end of the race, I was a little wet and a little tired, but I went home with a big smile on my face. The course was well marked, the people were friendly and happy, and the warm soup afterwards was delicious! In 2012, I went one step further, feeling strong enough to take on the 19k route. I felt okay for most of it, surviving the 12k portion I'd done previously and heading out into 7k of unknown terrain. It was fun until about 16 or 17k when the course shot nearly straight uphill. I was tired. The course was wet and slippery yet again. Once I reached the top of the hill I was exhausted, but I knew the end was in sight. In fact, I got so excited that I was getting close to the finish that I decided it would be faster to roll down the hill. It wasn't. In fact, it kind of hurt. I am still thankful for the nice guy behind me who yanked me up off the ground and made sure I was alive before heading off. This year, I didn't really know what to do. I knew I wanted to do the race, but I was having difficulties deciding which distance for a couple of reasons. In October I completed the BMO Okanagan Marathon for the second year in a row, knocking 15 minutes off my time while battling waves of nausea nearly the entire race. Here's what I learned: When you run a marathon, you should probably stretch after. Even if your muscles hurt so much that stretching feels like its doing more harm than good. As a result of my pure stupidity, laziness and hate of stretching (Who's with me? I mean, nobody really likes stretching), I ended up fighting a common battle among runners, IT band pain. This is something I had never really experienced before. After a few weeks of stretching and icing (not the delicious kind that comes on cakes) and stretching and icing and resting I couldn't handle it anymore.I needed to run! I had attempted a few runs, making it no more than 10 minutes without quitting due to the stabbing pain in my right knee. I did, however manage to squeeze in one 12k training walk, and one 12k training run before the race. I tried to run the first one, but I only made it about 2 minutes in the trails before I stormed angrily back to the car cursing my stupid knee and that darn marathon. Never again will I run a marathon on the road! After about 5 minutes wallowing in self pity I put on an extra jacket, grabbed my iPod and decided that if I can't run, I might as well walk. 1. Because I was dying to run. I was going to get through it even if I had to walk the whole damn thing. So here we are on race day. I've taken nearly a month off of running. Let's just say I wasn't quite as prepared as I had hoped to be. High on ibuprofen to ward off any idea of pain, I took off into the forest. The weather was the nicest I've seen in all the years I've done it, despite the weatherman calling for snow. The start of the race went well. A couple kilometers in, I was near the front of the pack. This may have been due to a large number of people taking a wrong turn early on, but that's a minor detail. I'm sure I ran those next few kilometers faster trying to keep up with those who had taken the wrong turn. About 5k in my legs were cold and felt a bit like lead weights. I made the decision to run the hills a) because I was hoping it would warm up my legs and b) I really didn't have anything to lose. Slowly and steadily I climbed the hills, and even though it didn't feel like I was going fast, I passed a surprising number of runners who were walking. Running up Bottletop Trail, happy as can be! By the 8k mark I was warmed up and feeling good. As I started the second major descent, I began to get cold fast. It was then I realized that my stomach was soaking wet. I am a sweaty person, but not THAT sweaty. My hydration pack was leaking on me. I tried several things to stop the dripping water, but nothing seemed to work. The valve takes a significant amount of effort to open and close, and my cold hands just couldn't do it. My only solution was to blow the water back up out of the tube after every drink of water so that nothing could drip on me. This took a lot of effort, especially when climbing uphill. At the 12k mark I realized that by some miracle I'd done it in 1h12m. Continuing on, the next portion of the race was a rather open section next to Lynn creek. It began to get colder, and I eventually reached a point where there was snow on the ground. I had to be extra cautious on the foot bridges as they were rather frosty and slippery. In the weeks leading up the race, I had wanted to get out and run/hike this last 12k section, as I was unfamiliar with it. Chris described the final section as a gentle ascent to a clearing, at which point you turn around and head straight back to the finish line, of course bypassing that nasty hill in the 19k route. He. Was. WRONG. Running through the beautiful snowy forest with a soaking wet shirt (somewhat dehydrated by now because drinking took way too much effort), that clearing could not come fast enough. And then the uphill came. I think that's the part Chris left out. You go to the clearing, and then you go up through this rooty, rocky, winding crazy path. It was nicer than the 19k terror. However, I must say it was a little unexpected. Although I wanted to be angry at Chris for leaving out the minor detail of the final uphill before the finish line, I couldn't. It was SO beautiful up there. I felt like a little kid again bounding over roots and rocks and splashing through countless streams as I ran carefree through the woods. DO THIS RACE. It is so much fun. I made it to the finish line in a 2h38m, dehydrated, freezing cold, and loving every minute of it!! After all that, I completed the 24k only 10 minutes slower than my 19k time the previous year! I am getting stronger! I sit here now getting ready to take on whatever is thrown at me for the Dirty Duo 50k in March. I hope you'll join me and follow along as I train to take on double the distance of my longest trail run yet! Let's do this! Don't let the sands of time get in your sandwiches.